The Galaxy Book series is a tablet-laptop hybrid capable of running Windows 10. The company also announced the Galaxy Tab S3, an all-glass tablet focused on multimedia. 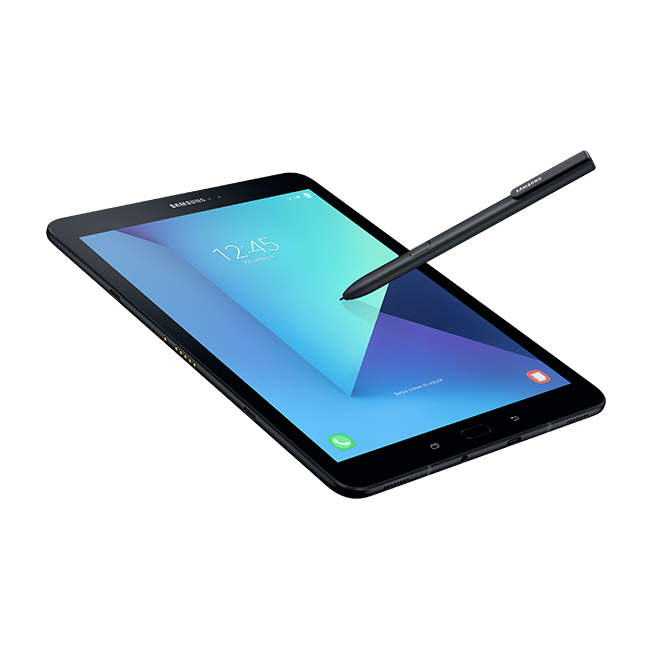 Korean conglomerate Samsung revealed two new types of tablets today at Mobile World Congress in Barcelona: a high-performance Galaxy Book series with full desktop PC capabilities, and the sleek, all-glass Galaxy Tab S3, a tablet optimized for entertainment. Price and availability have not been announced for either device. The Galaxy Tab S3 is really Just Another Samsung Tablet (but in a prettier, sleeker mirrored glass case). It has a 9.7-inch AMOLED screen with 2048 x 1536 resolution with HDR, 10-bit color support to watch Netflix and browse Facebook. There are four speakers that detect tablet rotation and change the audio output to reflect whether the device is in landscape or portrait. At .928 pounds, it’s slightly heavier than the previous Tab S2, and Samsung claims it has a 12-hour battery life. The tablet uses the new USB Type-C port for charging. Some of the standout software features include a blue light filter that eliminates blue light while reading or browsing. (Blue light may block the production of melatonin, a chemical that makes you feel sleepy.) There’s also a new game launcher that blocks notifications during gameplay. It’s powered by the latest version of Android, Nougat 7.0, a Snapdragon 820 processor, 4GB of RAM with a microSD slot for up to 256GB of storage, a 5MP front-facing camera, and a 13MP rear camera. The Tab S3 comes with an S Pen stylus for note-taking, creating GIFs, and quick translations. The tablet also has a special connector that works with a keyboard cover, sold separately. Neither the keyboard nor stylus require pairing or charging. The Galaxy Book series — Samsung’s answer to the iPad Pro and Microsoft Surface — is a workhorse designed with productivity and multitaskers in mind. It’s a convertible laptop/tablet hybrid that comes in a 10.6-inch and a 12-inch version. The new device’s most notable capability is its ability to run the Windows 10 operating system, meaning that it can easily go from a touchscreen tablet to a true laptop PC. The hybrid is super slim, at 7.6mm thick, and weighs a pound and a half. There are also 2 USB-C ports for accessories or monitors. 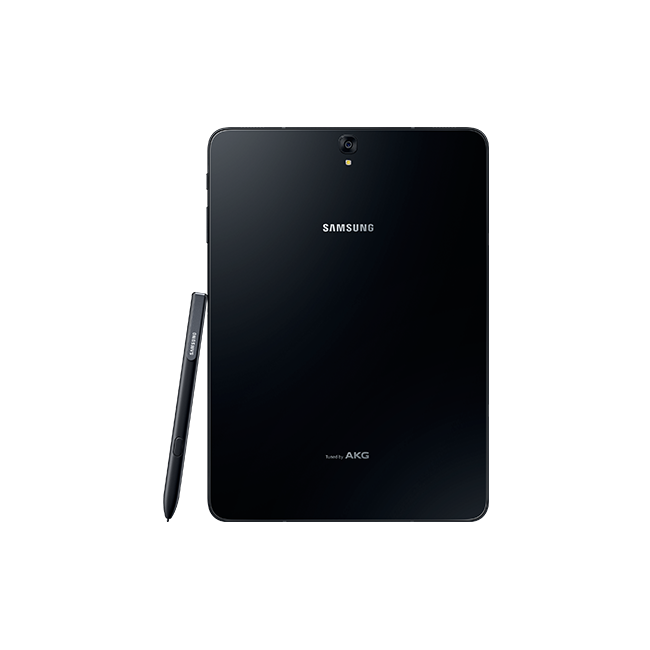 It ships with an S Pen, which is compatible with Adobe’s programs out of the box. The Galaxy Book also includes a backlit keyboard. Samsung has had a rocky several months following the recall and eventual discontinuing of the Note7, built with faulty batteries that led to explosions. Samsung’s reputation in the US plummeted as a result. Company Vice Chairman Jay Y. Lee was formally arrested on unrelated bribery allegations. Samsung kicked off Sunday’s presentation with a video highlighting the company’s commitment to quality assurance, showing that its phones are tested and re-tested. “The past six months have undoubtedly been the most challenging periods in our history,” said Samsung CMO David Lowes. Samsung is holding off on announcing its top-of-the-line flagship phone, the Galaxy S8, for now. The new phone now has an official announcement date (March 29) and is rumored to have an April 21 release date. The only other tidbit we heard from the company today is that its newest phone will ship with specially tuned AKG earphones. An app image may have revealed the design of the S8. According to the mockup discovered by SamMobile, the S8 may feature a button-less, nearly bezel-less design. Leaks indicate that the new phone will have an even larger display than past devices, come in two sizes, and feature Samsung’s version of Google Assistant and Siri, called Bixby. Stay tuned for more news on the Galaxy S8 in March.